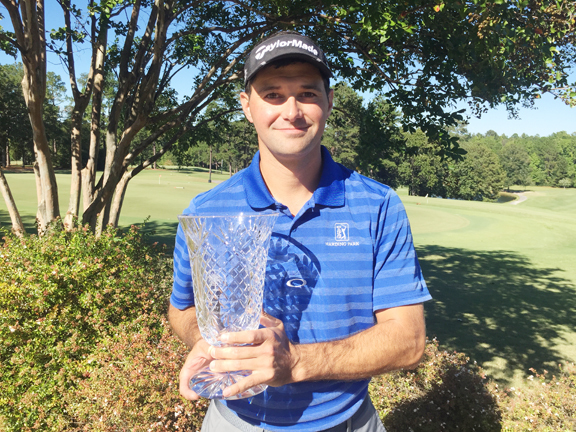 Chris Eassy of Greer won his first major SCGA Championship taking the top spot at the 2016 Mid-Am Championship played at The Country Club of Lexington. The Holly Tree Plantation golfer shot rounds of 67 and 71 for a 138 total and a two shot victory. “I’ve had a few good finishes over the years,” said Eassy. “I’ve won some partner events, but by far this is my best individual win,” he added. Eassy opened the tournament with a share of the first round lead. Eassy shot a 5-under 67 to finish the first 18 holes tied with Jarrett Grimes of Columbia and Troy Miller of Charleston. “With the hurricane coming in the conditions were really difficult. Lexington has some very fast greens and the wind made every shot more difficult,” said Eassy. The winds gusted up to 25 miles an hour and the tournament field was fortunate to get the first round completed. The second round of the scheduled 54 hole championship was cancelled because of the effects from Hurricane Matthew’s hit on the Midlands. “We knew before we started the first round that it was only going to be a 36 hole tournament. The forecast called for a lot of rain and the course would have been impossible to play on Saturday. I just hung around the hotel and watched football. I didn’t do anything with golf,” said Eassy. When play resumed on Sunday morning, Eassy never lost his share of the lead. He stayed tied with Grimes, but both golfers lost a shot to par. 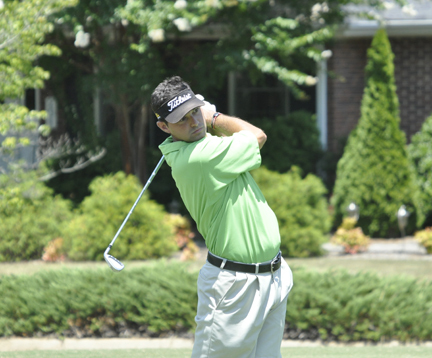 Former champion Steve Liebler of Irmo closed to within a shot before Eassy shot his way into the lead. Eassy carded birdies on numbers 9, 10, 12 and 16 to pull away from Grimes and the field. A bogey on the final hole still left the 2004 Greenville County Amateur champion with a comfortable lead. 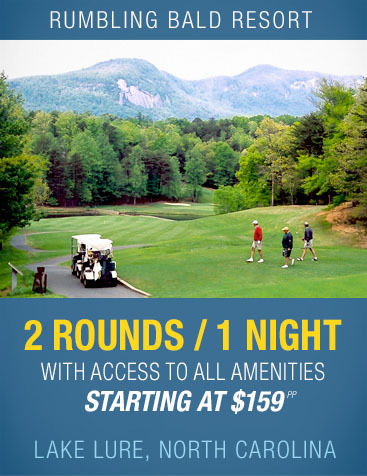 “I hit a wedge to about two feet on number nine and then rolled in a 30-footer on 10 and got two more birdies before I messed up and bogeyed the final hole. “It didn’t matter because I had a three shot lead,” Eassy said. Eassy won the state title over Grimes and Brian Quackenbush of Aiken. The two golfers finished in a tie for second place with 4-under par 140 totals. Kevin Roberts of Chesnee posted the best final round score shooting a 5-under par 67 to move up into a three-way tie for fourth place. Roberts finished with a 141 total along with Steve Liebler of Irmo and Kyle Milner of Spartanburg. Eassy’s victory caps improvements to his game that have taken place in the last 18 months. 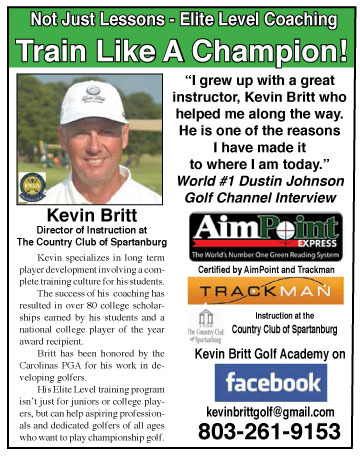 “I started playing better last year at the state am at Chanticleer. I finished in sixth place and just kept playing better since then. I changed my putting grip. 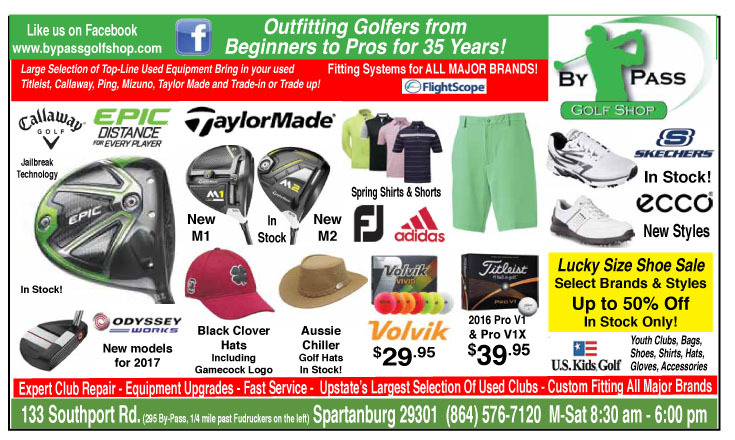 I went to a left-hand low grip and it has made a difference,” said the new Mid-Am champion. While Eassy now owns a major state golf title his next competition will be for local bragging rights. “I would like to win the Holly Tree club championship. We have so many good golfers at the club it would be almost as good as winning the Mid-Am,” concluded Eassy.